Another young calf in the close-knit family is getting sicker. 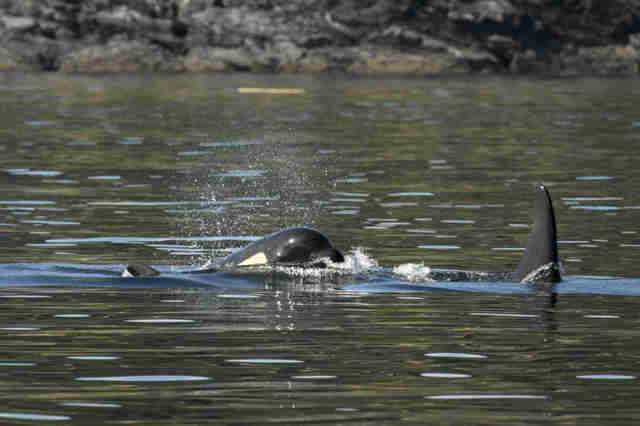 A 20-year-old wild orca named Tahlequah caught the world's attention when she suffered a terrible loss — after giving birth on July 24, Tahlequah was able to swim with her newborn calf for just a half an hour before the little orca passed away. She refused to let go of her baby's body for over a week. 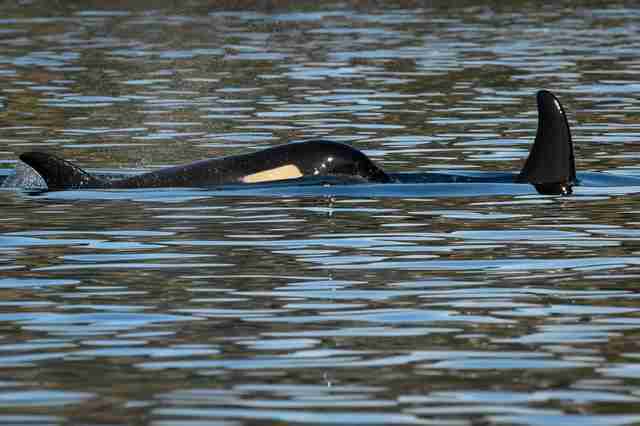 And Tahlequah's pod may soon have to grieve another loss — a 4-year-old orca in J Pod, J50, also known as Scarlet, is terribly sick. Tahlequah — who is also known as J35 and is a member of the J Pod (one of three pods that make up the endangered southern resident killer whale population) — has carried the body of her calf for at least 11 days, refusing to let her baby sink into the depths of the Salish Sea off the coast of British Columbia, Canada. Observers of Tahlequah, who saw her with the body and then without and then with the body again, inferred that other members of the pod may be helping the exhausted Tahlequah carry the body of her baby. Tahlequah's actions sparked worldwide discussion around the emotional lives of animals and how we human beings perceive them. "J35's incredible persistence in diving deep to retrieve the small body, even in the face of her weakening condition, speaks to her great emotional distress," Barbara J. King, professor of anthropology at the College of William and Mary and author of "How Animals Grieve," told The Dodo last week. "Tahlequah kept the body at the surface, supporting it on her head or holding it in her mouth. Orcas and other cetacean species have been observed carrying their dead, but rarely longer than a day," Susan Casey wrote in a New York Times op-ed. 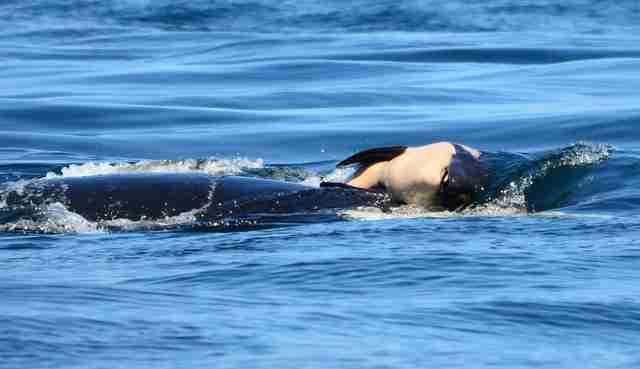 "Tahlequah has been swimming with her daughter’s body through choppy seas for, as of Friday, 10 days and counting, on what social media observers and orca researchers call a 'tour of grief.' They’re right." Her plight has also highlighted the grave dangers facing the southern resident killer whales, who have struggling to survive for years due to environmental changes, like the damming of rivers that cut off their food source of Chinook salmon. The population previously suffered losses in the 1970s, when SeaWorld and other marine parks took a generation of baby orcas for display in captivity. Now that Scarlet has perhaps just days left to live, the danger to this family of orcas is impossible to ignore. "Sightings indicate that the whale is emaciated and is sometimes lethargic in the water, but still has periods of activity, including feeding," the National Oceanic and Atmospheric Administration (NOAA) wrote. "Analysis of a small sample of her breath did not definitively indicate an infection or illness, although it does not rule one out either. The scientists who have observed the whale agreed that she is in poor condition and may not survive." Scientists have discussed plans to intervene, feeding Scarlet salmon laced with medicine to try to save her. 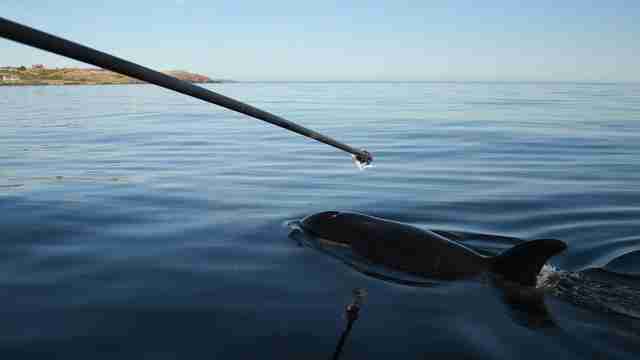 This is something they would do only in the most dire of circumstances, since feeding wild orcas can disrupt their natural independence and ability to hunt for food themselves. A team of researchers will be meeting this week to try to figure out what the best course of action for Scarlet is. Meanwhile, people who have empathized with Tahlequah are bracing themselves for another loss. 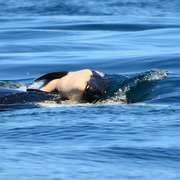 "J50's ailing state and J35's grieving for her dead calf are waking the world up to what cetacean biologists have been telling us: how devastating even one single further orca death in this population would be," King told The Dodo. "Only 75 whales are alive now in the three pods J, K, and L; they are at risk of starvation and even of functional extinction if the mothers and youngsters cannot get salmon to eat. While I can speculate that further deaths would almost certainly cause great emotional distress to these orcas themselves, I can say with certainty that such an occurrence would mean an irreparable loss to the natural world." Casey added that if we "aren’t willing to turn our empathy into action, then one day in the near future we will explain to our children and grandchildren how incredible the orcas were, and how bad we felt about their fate. How their pain resonated with us and caught our attention. How deeply we felt their loss. Just not enough to do what was required to save them." 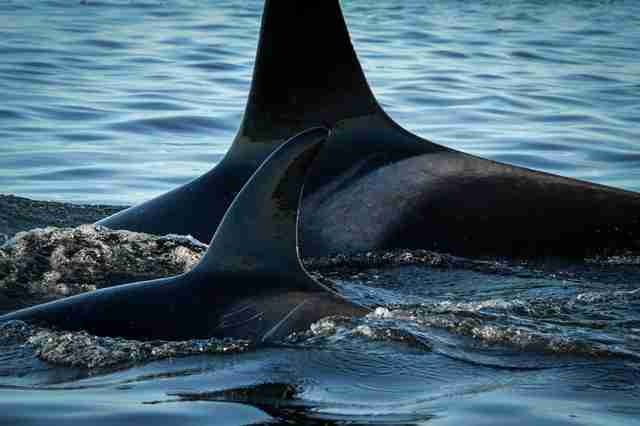 You can help save these orcas by signing a petition to breach dams and make food sources available to these orcas again. You can also make a donation to the Center for Whale Research.